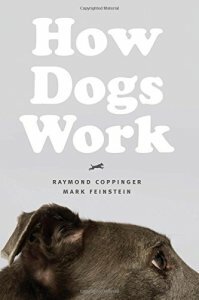 Anytime a book merges canine behavior with thermodynamics (the study of how things move) it represents a milestone in Dogdom. “How Dogs Work” by Raymond Coppinger and Mark Feinstein, (University of Chicago Press) is such a book. What’s revolutionary about “Work” is that as frontline science it moves away from a wholly gene-centric view of behavior while simultaneously pouring cold water on the current trend of seeing high cognition in complex and ingeniously adaptive behavior. 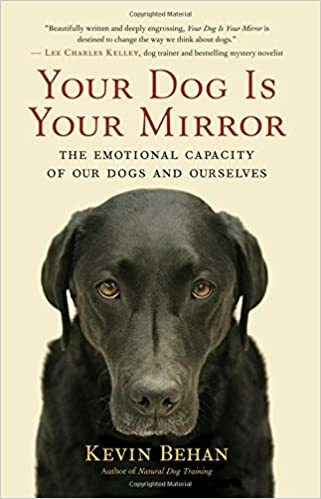 Coppinger’s thesis is that the mind of the dog is shaped by the shape of its body parts, shapes that determine how these parts interact, most especially during their development in the earliest phases of life and as its motor systems are coming on line. Then, functioning as a whole, this renders a shape that determines how the body interacts with its surroundings, which then shapes how the mind is formed and operates. Thus an animal is a kind of biological machine and the interplay between all its moving parts creates its own kind of information, a shape (not only in its form but the shape created by how the form moves through space over time) that isn’t genetically based or cognitively driven, and yet informs movements that engender ever more complex shapes. Ultimately this shape can manifest into a collectivized expression that historically have been anthropomorphized and attributed to human like intellectual capacities and which thereby obscures the emergent, self-organizing nature of the phenomenon. I can appreciate how Coppinger’s language seems more reasonable and down to earth than my writing. It may not seem from these comparative excerpts that I’m saying something analogous to Coppinger. It’s as if I”m talking of “humors” while Coppinger is dealing with motor patterns. Coppinger says emergence, in NDT I say “harmonic pathways.” (In my next post however I’ll explore which term—emergence or harmonic pathways——proves to be more concrete and informative. Why then is there such a gap in these respective passages, so wide that the two systems can’t interface? In my view it’s because while both NDT and Coppinger correlate on the impact of locomotion and motor patterns, when it comes to the mind of the dog, Coppinger applies abstract concepts (intrinsic rules, emergence) and mathematical descriptions to behavior, whereas I’m talking about what’s going on inside the mind of the dog itself. (Something is of course going on in there and it’s safe to say there isn’t a neurological math module tucked away in the cranium running an algorithm.) Therefore, because something is going on inside the mind of a dog, speculating and making informed determinations based on experience and reinforced with science from many disciplines; biology, neurology, emotional research and most importantly physics, is not anthropomorphizing when it isn’t inserting human, abstract thoughts into the heads of dogs. My definition of a sense-of-self doesn’t require the individual to be a self-contained agency of intelligence, anymore than an immune system requires an intellectual construct of a self in order to discriminate between that which is of the body and that which is foreign to its well-being. In my model emotional states are not thoughts whereas I believe Coppinger equates thoughts and self-awareness with consciousness rather than as aspects of same. I see emotion as a physical state of awareness through the individual’s emotional perspective of attraction, a subsequent sensual or sensitive response to resistance, and which then leads to behaviors that ultimately effect a networked-intelligence from which derives the true nature of consciousness. In other words, animal behavior is adaptive when animals move in ways that are concordant with the way forces, energies and objects of mass move in nature. This is how potential life sustaining energies are identified, captured and then harnessed. I do believe nevertheless that Coppinger’s book in conjunction with the Constructal law allows NDT to directly interface with modern behaviorism as I strive to show below. I would also like to reiterate that since the eighties I have been teaching that not only is there no such thing as dominance and submission, but neither is there such a thing as territoriality, and there also is no drive to survive—-there is only a drive to move and when one takes the thermodynamics of all that entails into account, this readily encompasses the survival and reproductive mandates. We could say that survival and reproductive success are emergent phenomena, just like the sheep guarding dog. I am also curious as to how the systems logic approach to the modern research of Coppinger, Dubois, Wynn, Udell, et. al. have to say about territoriality. Finally another point on which NDT has proven to being ahead of the curve is in regards to learning. To date it’s been posited as high cognitive intelligence, as deductive problem solving as for example tool use in corvids. But my theory is that even learning, other than human linear reasoning—is also a function of evolution, in other words, it’s the same dynamic simply running on a hyper fast track. Complex behaviors have a shape. Shapes evolve into form, they don’t leap into being through a cognitive eureka leap of reasoning. Learning will prove to be rule driven according to a thermodynamic mandate, to wit: The Negative-as-Access-to-the-Positive. And in regards to the reinforcement aspect of modern learning theory, when Coppinger talks about intrinsic rule driven biological mechanical systems—of which organs, tissues and brains are its parts— that then accommodate to each other’s development and from which complex behaviors emerge, this therefore means that such emergent actions (the basis of complex adaptive behavior) are self-fulfilling no matter what material consequences are or are not realized. Such actions feel fulfilling because they manifest the emergent virtue of being highly conductive, i.e. the parts get to work together in accord with the only way they can work together. Getting to such a state is therefore intrinsically satisfying. In effect Coppinger is talking about a principle of conductivity and behavior flowing according to paths of resistance, the essence of Drive and the central premise of NDT. In other words, the mind of each individual is shaped by the emotional displacement of fellow group members and perception, emotional disposition and behavior precisely accommodates to the emotional mood that emerges. When wolves align and synchronize with each other along the prey’s path of travel and thus strive to achieve a circle, then that activity is self-rewarding, it doesn’t matter whether or not they bring the prey to ground to experience a feeling of “reward” for pursuing that line of activity. the same is true of the sheep or sled dog. And this also means that wolves have no intension of killing in order to eat, this intentional goal is the projection of a human intellectual narrative of processing reality rather than an objective reading of the evidence. Bringing a prey to ground is an emergent behavior, not an intentional act. Coppinger is saying that the intellectual basis of modern learning theory is incorrect. Nevertheless we’re both talking about a systems’ logic and I would like to reiterate that my manner of analysis (emotion as an immediate-moment “force” of attraction) arrived at these understandings in the eighties, during the height of the gene-centric focus on behavior—-the dominance explication for social structure, accredited at the time by the most august wolf researcher, David Mech——-as well as the era when Border Collies were touted as smartest breed on four legs (Stanley Coren). While behaviorism of that era was looking for the genes for aggression, I was understanding aggressive behavior as a function of inter-connected parts responding to resistance either sensually, or not, in which case we observed aggression. If I had access to the terminology as now offered by Coppinger I would have said Aggression has a shape. 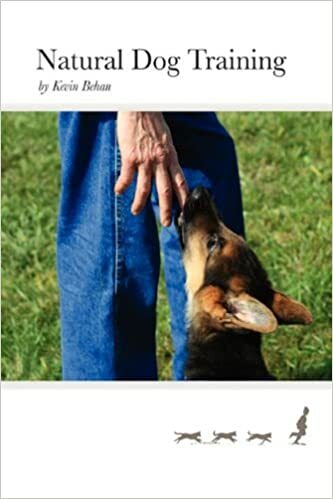 (In fact a chapter excised from “YDIYM” due to space restrictions was entitled the “Geometry of a Feeling.”) I don’t say this to aggrandize but to point out that an immediate-moment manner of analysis, emotion as a force of attraction, is a logical and parsimonious interpretation of canine behavior. In contrast using human concepts which to date has been the explanation of complex social behavior is the radical approach. After exploring in “Work” how intrinsic rules help body parts accommodate to each other and render new body shapes and therefore brain and physical capacities, Coppinger turns to the phenomenon of emergence theory and canid hunting. During the eighties while I was working out the thesis of “Natural Dog Training,” I visualized the group as a circle, a shape, a configuration that shifts as the prey at its center shifts. If you’ve attended any of my talks you may recall the circle as a constant fixture of the white board. (It’s about the only drawing I get right.) The group is a circle, the circle arises AROUND THE PREY. In other words, the prey is the leader of the group if a leader is a concept we must apply. This same template is in effect in all interactions, between parent/offspring, male/female, peer-to-peer since emotion moving from high pressure (predator pole) to low pressure (prey pole) as a virtual force of attraction is underlying and underwriting each and every interaction. In other words, this capacity to shift as a whole, to accept a new midpoint, to reorient collectively to social shifts, is the same capacity to admit newcomers into the group. Or to be more specific, to admit objects of intense resistance into a new social configuration. This is the essence of sociability. I didn’t articulate it as two simple rules, rather as emotional states of inhibition relative to arousal to bite, with each individual of the group falling out along this gradient. Since this is all overarched by a state of attraction, the movement is implicit. I speak of what’s going on in the individual mind because there is no rule-driven module running an algorithm, there is no CPU whirring away and mathematically computing what’s going on. Rather, there is a feeling, a feeling with a number of midpoints around which each individual revolves in order to satisfy a common state of attraction. Feelings have a geometry, they arise from emotion as a universal state of attraction (the intrinsic) so that they accommodate each other to maintain their configuration as a circle and thus sociability EMERGES. In other words, they are attracted to each other, peer-to-peer with the same Drive (but which can’t be consummated through social interactions) that attracts them to a large, dangerous prey. They HUNGER for a degree of physical, tactile contact that they can’t consummate interpersonally. Only by working together to overcome a large enough obstacle of resistance that can elicit their bodies moving at full speed can they move their bodies at a state of full emotional vigor. The social unit they embody collectively INCLUDES THE PREY. There is a functional “group mind” and even the prey feels its respective slice of the continuum and in fact could easily exploit it if it could feel the emotional leverage inherent in being the object-of-attraction. Each individual’s sense-of-self encompasses their peers and the common object of resistance they are all mutually attracted to. The circle they configure recapitulates the first ten days of life where their respective urges to ingest were at their strongest and at their least differentiated one from the other. There is not even the idea that “I want to eat that Moose” as if there is a “me” and then there is an “other-than-me” construct of experience. The Self encompasses the ALL when there is a feeling of flow. Each individual will have a different perception depending on where they find themselves in that flow configuration and they will adjust accordingly but not due to rational deductive thinking. These feeling states are variants along a gradient of an electromagnetic-like nature that can be described mathematically and in terms of a systems rule-driven logic, but they are neither. For example, light propagates according to a precise mathematical formula which is how its speed was calculated in the nineteenth century and well before it was well understood. But of course light itself isn’t operating through a mathematical calculator. Emotional states and emergent Feelings are electromagnetic-like phenomena. They factor for attraction and repulsion as well as closing the gap to make contact and achieve consummation. So social systems evolve, the canine being one of the most highly evolved social systems with a prolonged upbringing and collective rearing of the young, in real time (and over the course of geological time) via the predator/prey dynamic. As a point of distinction therefore,“Work” has sociability and hunting disconnected, whereas in NDT sociability EMERGES from hunting. This I believe is the most logical interpretation of evolution and domestication once the notions of intrinsic, accommodative and emergence are fully considered. In other words, it emerges in the moment. If complex and intelligently adaptive behaviors arise via intrinsic rules, accommodative exigencies and emergent phenomena, then the animal mind works within the framework of the immediate moment. It is not goal driven and reading an intentional state into a behavior is a huge leap in magical thinking, literally. Super fun to see the field opening up. I have worked with simple rules and other complexity tools in human systems and it’s exciting to see that world bridging with your work. Were the authors aware of your previous efforts in this direction? I do believe there is going to be a shift. There seems a quickening to rethink long held assumptions. I’m not sure to what degree they’re aware of my theory, it’s easy to ignore given that it hasn’t arisen through the traditional ranks and then my language would throw the scientifically minded reader off, as well as making it convenient for someone to misread what I’m saying and not deal with the argument. Nevertheless, thermodynamics and the laws of motion lead to attraction and the immediate-moment manner of analysis.